If you get stuck outside without your insect repellent this common weed may save you some misery. Yarrow! Yarrow can be found worldwide and grows in dry, open areas. 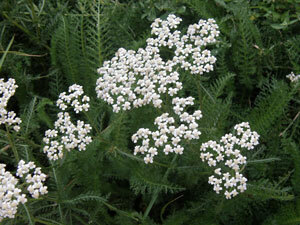 Once you identify yarrow, pick a handful of leaves and/or flowers and rub them briskly between your hands. Now rub the scent over your skin, head and clothes. Mosquitos and deer flys hate the smell so it's a great emergency insect repellent! Oh yeah, another great survival tip about yarrow is that it has an amazing ability to stop bleeding. So if you suffer any type of wound and need to stop the bleeding now simply fill the cut with crushed yarrow leaves. It's also antibacterial so it will help prevent infection too.